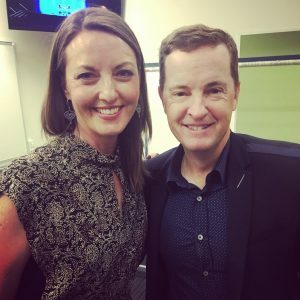 With Matthew Reilly at the launch of his latest novel. There wasn’t much notice before my booking to speak with blockbuster novelist Matthew Reilly for Dymocks. I had ten days to get across the body of work he’d amassed since I read Ice Station and Contest fifteen years ago. The thing about talking to someone like Reilly is that it’s not enough to just read the current book. He has an army of fans who have read every book, know every character as well as they know their mates, and want to hear a fairly in-depth conversation. Yikes! In my ten days lead time, I set myself the task of listening to the audio books of Reilly’s last two works The Four Legendary Kingdoms and Three Secret Cities. The first listening hour of my return to his work was a total shock to the system. Jack West Jr, the hero, wakes in a cell where his first task is a fight to the death with a Minotaur. Finding he’s had a chip inserted into his head, he steps out of the cell victorious to find he’s in a bizarre championship where none of the heroes are there voluntarily. One participant complains. And the chip in HIS head explodes instantaneously…. I think I vocalised a lot as I was listening to these books – disbelief and horror mainly. But I got seriously hooked very quickly. So I wasn’t surprised when I arrived at the venue to see that Matthew Reilly’s fans at Dymocks had made (with Lego), three easily distinguishable scenes from the new book. The scenes were admired by Reilly, lusted after by the fans, and won by three very excited people via a raffle draw at the end of the night. I’ve thought about this experience a lot. It was a lesson for me to see how deeply invested Matthew Reilly’s fans are. Their questions had depth and Reilly was generous in his responses. In my ten days immersed in Reilly and his work I could easily see how this engagement had been earned and how much responsibility he carries, not only in delivering the next instalment, but in deciding the fates of favourite characters.